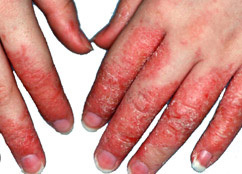 Ruth, who blogs at What Allergy?, asks is there an eczema solution? And John Scott replies - yes! Is there an eczema solution? Anyone with eczema has probably spent most of their life searching for it; that elusive solution to all your itching woes. I’m afraid I don’t have amazing news: there really is no eczema cure, but there are lots of tiny changes you can make to your life that will make a big impact on how you manage your eczema. My eczema has been pretty bad lately and sometimes it’s useful to go back to basics and see what things you’ve stopped doing, what lessons you’ve forgotten, but our bodies are such complex machines that it’s not always that easy. Things change too. Cycles repeat, maybe after years of good skin things can flare-up for no good reason. Suddenly you may begin to react to certain skincare products or foods. Over the years I’ve learnt a huge amount about what triggers my skin reactions and gained a much better understanding of my body, how eczema manifests itself and the management techniques which help me stay in control. What is hard is the overwhelming ‘hatred’ of my eczema. I hate mine. I loathe it. And I call it ‘my eczema’ as if it’s special, as if I’m proud of it. But this is so disruptive and unhelpful as once you have eczema or atopic skin you will probably never be completely free from it. It’s very hard to live with it when it’s bad. I came across an old book recently called ‘The Eczema Solution’ which got me thinking about this magical solution. I do believe there is an answer out there. Somewhere, sometime we will be free from eczema (in my dreams anyway). I flicked through the book again out of desperation since my skin has become so problematic and I’ve slipped back into the vicious itch scratch cycle. What could this book show me on the second reading? The first wonderful discovery, neatly stored inside the book, were all my notes and sketches from when I read it the first time around. Priceless! The book explores firstly your habits. When do you scratch most? Are you more itchy at certain times of day? Do particular activities trigger itching and does it affect only certain parts of your body? Most importantly, how often do you scratch? Then you count, actually count every scratch which is depressing as the numbers sky rocket. Then you get to the good bit, how to reverse the habit of a lifetime. One technique did stand out which does help me. I press a finger nail on the itch and hold still for 30 seconds. Dangerous, as one slip could go from safety to gouging and digging at the itch. Distraction techniques can also work well – can someone sit on my hands, please? But no amount of habit reversal or understanding is any use if something unknown is causing your eczema and there can be a myriad of different things for each person. e.g. is your skin too dry, are you hot, stressed, is your clothing itching, are you allergic to dust, airborne allergens, food allergens? I could go on and on. The importance of regular exercise, eating a balanced healthy diet, using emollients effectively, keeping hydrated, getting the right nutrients and minerals, avoiding stress and triggers etc. are all vital in managing eczema. Basically you have to be perfect, never eat anything bad, not drink alcohol or coffee, go to bed early, and be a saint forever. It’s almost impossible to maintain so we slip back into stress, itching, scratching, using steroids and lack of sleep. Until you’ve had eczema you will never understand the deep, urgent, painful, distracting and completely disruptive urge to scratch. The one thing the book doesn’t address is the affect food can have on eczema. It is well documented that there is a direct link with dairy and delayed eczema reactions. I know this is one of my triggers. So no amount of habit reversal and saintly behaviour is ever going to help if you’re still eating that cheese you love so much. The important thing is to learn how to stay in control or yours. What triggers your flare-ups? Don’t feel bad if you give in to that incredible urge to scratch. It’s OK to scratch, don’t beat yourself up. Instead learn from scratching episodes, think about why it happened and what you might do differently next time. However, John Scott believes that helminths provide the very solution that Ruth is seeking. "Both my daughter and I had eczema and although the main condition she took hookworms for, was Crohns, it has cleared up our eczema. I take hookworm and whipworm just as a parental dose to support my daughter but my eczema has completely gone." While there have not yet been any clinical trials of helminthic therapy in the treatment of eczema (and there are unlikely to be any in the foreseeable future because drug companies will not be able to make money from this treatment option), there are existing studies pointing to it's potential, including this one showing that a malarial infection can ameliorate atopic dermatitis-like skin lesions in mice. There are also many additional anecdotal reports from people who have successfully put this condition into remission using helminthic therapy. Some of these are presented below. "The symptom that reduced the most was skin problems (eczema) and general itching of the skin... which was one of my most bothersome symptoms before hookworm." Read more. "One of my symptoms was severe eczema in the crook of my left arm. This has gone into complete remission since treatment." Read more. And this was still in complete remission 2 years later: Read more. "... I always have little, random patches of eczema-like rash... about ten little patches at any given time on arms, shoulders, neck, or ears, and in the last month it's been closer to two at a time. At the moment I have NONE, which is unheard of for me." Read more. "I'm at 18 months now, and I have seen a gradual and consistent improvement over this time in both my food allergy/intolerance and my eczema. The improvements in the former have been so amazing that they have overshadowed the changes to my skin, but these have also been occurring very gradually over the 18 months to the point where I now only have three tiny patches of eczema that still need to be creamed, and now only every few days. This is instead of having to apply lashings of cream, every day without fail, to both feet, both knees and both elbows." Read more. "He used to break out in eczema if he had gluten more than 2 days in a row and now he can eat it every day." Read more. "I had eczema mostly on my hands and arms, and sometimes on my neck for about 20 years. For the last 10 years or so I used prednisolone as needed. My first dose (of hookworms) was 2 months ago. I have had no eczema, and haven't been on pred for a few weeks. My skin hasn't looked this good in 10 years, and especially without any drugs." Read more. "It's now been a bit more than 6 months since my initial inoculation, and I'm now the proud mom to 85 hookworms and the results I have seen have been amazing! My eczema is fantastic! All summer I was able to wear short sleeves without worrying about how bad the eczema on my arms was." Read more. "My eczema is prone to occasionally re occur but is much better than it was a few years ago, at this time of year I would scratch my skin raw in my sleep (very disturbed sleep) and flake dry skin all day. It was unbearable, my wife was genuinely concerned for my mental health. I feel more relaxed and generally contented than I can remember." Read more. "Our two year old son was sensitive to fragrances in detergents and soaps - we noticed he would scratch excessively if we put him in clothes that had been washed with scented detergent, and his eczema would flare up. (He has had mild eczema since he was 3 or 4 months old.) Since his first dose with 5 HW about 13 weeks ago, we have seen a significant improvement! His skin is pretty much clear, just a small patch of dryness on each of his feet. He no longer seems bothered after washing his hands with scented soap (this used to make his wrists itch for hours)." Read more. "Our 2 1/2 year old started with 5 HW in May 2013. He had eczema, mild food allergies (egg white, wheat, and peanut), and was sensitive to fragrance and some foods (dairy, potatoes). So far we have seen significant improvement in the eczema and sensitivities. We have reintroduced dairy and potatoes in small amounts with no reaction…"
I also wonder if Ruth has tried bleach baths or emu oil. It's unlikely that either of these is in the same league as helminthic therapy in terms of potential to put eczema into remission, but there's enough evidence to make me want to try them, if I were in Ruth's shoes. Dilute bleach baths see here, here and here. A handful of studies have suggested that emu oil, applied topically, may have anti-inflammatory properties and promote wound healing in various rodent models. However, there may be considerable variation in potency between different commercial emu oil products.